SAFE Act Proponent Charged for Carrying Gun on Campus. Gun Controller Dwayne Ferguson, who pushed the SAFE Act has been arrested based on that same law. Ferguson has a permit to carry a firearm, and frequently does so. He apparently forgot that he was packing, when he attended a mentoring program at New York’s Harvey Austin Elementary school. There was a lock down as the police searched for a man with a gun on campus during the after school programs. Lo and behold…… who did they find but Ferguson, who had led about 50 kids into the cafeteria, and closed the doors, to protect them from …HIMSELF!!!! Ferguson is charged with 2 counts of criminal gun possession, under his very own SAFE act. The guy thinks that the people who voted for him have changed their minds because they don’t like his color anymore. It wouldn’t have anything to do with the slumping economy, the record joblessness among Black Americans and the rest of them too, the burdens and planned malfunctions of Obamacare, the incompetent foreign policy, the NSA snooping, and the abnormal symbiosis with Planned Parenthood. Noooooooooooo…. they don’t line his skin shade anymore!!! 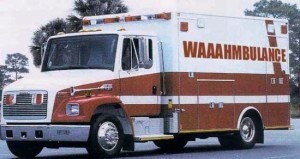 Call a Waaaaaaaaaaambulance for Obama.